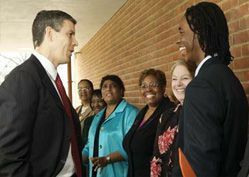 Secretary of Education Arne Duncan last month announced that $44 billion for states and schools is now available under the American Recovery and Reinvestment Act (ARRA) of 2009. The feds hope these monies will “lay the foundation for a generation of education reform and help save hundreds of thousands of teaching jobs at risk of state and local budget cuts.” As you’ve probably read or heard in some vague way, this effort involves “modernizing America’s classrooms.” So what does that mean exactly, when it comes to integrating technology into public education? We read the fine print so you don’t have to. Will individual schools be able to apply for innovation grants as part of the stimulus funding available? to the Top program, $4.35 billion will be awarded in competitive grants to the states. The remaining $650 million will be distributed to local education agencies and nonprofit organizations through the Invest in What Works and Innovation Fund. Watch the Department of Education recovery Web site for additional information regarding these plans. It is important to note that these programs are intended to reward education agencies that have implemented innovative programs that have proven successful. How does the stimulus funding help the average classroom teacher? The goal of the state stabilization fund is to help schools facing layoffs and other funding concerns. Each state has the authority to determine how the funds will be used within wide parameters. To find out how your state is distributing its stimulus funding, check out Recovery.gov. State-specific information can be located here. The best way to find out how this will affect your classroom is to talk to your school administrators and become involved in the budgeting process. A large part of the funding is directed through Title I, IDEA, and EETT. The direct impact in your classroom will be relative to the amount of funding your school is receiving through those programs, in addition to how your state chooses to allocate the state stabilization fund. Will private schools receive any funding? If the school is eligible for IDEA or EETT funding, the school may be eligible for funding through the stimulus. Additionally, private schools can investigate other grant opportunities outside the stimulus package. Please see the supplementary download for ways to locate other grant options.